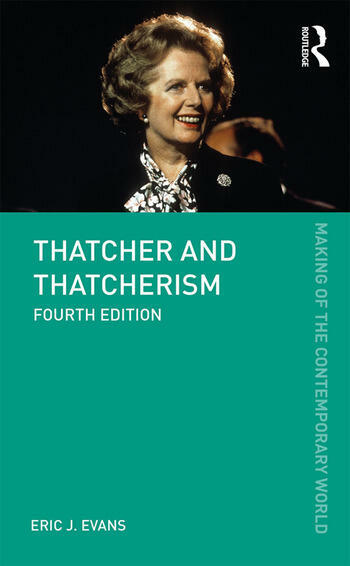 This revised, expanded and updated fourth edition of Thatcher and Thatcherism examines the origins and impact of ‘Thatcherism’ both as a cultural construct and an economic creed from the 1970s to the formation of a coalition government in 2010. New to this edition is an extended exploration of Thatcher’s impact outside of the UK, as well as an examination of the assessments published following her death in 2013, providing students with a greater understanding of the legacy of Thatcherism within the modern political landscape. Focusing on the career of Margaret Thatcher, Eric J. Evans questions both the originality and the ideological coherence of what came to be called ‘Thatcherism’ and considers to what extent it met, or failed to meet, its main objectives. Neo-liberalism and its influence on, and under, Thatcher. With comprehensive suggestions for further reading and explanation of the economic, social and historical context of Britain in the late 1970s and 1980s, Thatcher and Thatcherism is an invaluable guide to the complexities and paradoxes of Britain from the late 1970s to the second decade of the twenty-first century. Eric J. Evans is Emeritus Professor of Modern History at Lancaster University, UK. His many books include Sir Robert Peel: Statesmanship, Power and Party (2nd Edition, 2006), The Forging of the Modern State: Early Industrial Britain, 1783–1870 (4th Edition, 2018), The Shaping of Modern Britain: Identity, Industry and Empire, 1780–1914 (2011) and Britain Before the Reform Act Politics and Society 1815–1832 (2nd Edition, 2008).